We have some excellent news! Bill & Ted Face the Music, at long last, is happening. For real this time. This is one of those projects that has been discussed to death and we understand people being afraid to get their hopes up. However, original stars Keanu Reeves and Alex Winter have both personally confirmed that the long-awaited sequel is finally going to head into production this summer. What's more, is they confirmed that the movie will be heading to a theater near you in summer 2020. The video kicks off with the two gathered at the Hollywood Bowl proclaiming that, together, they make up the band Wyld Stallyns. That alone is delightful. 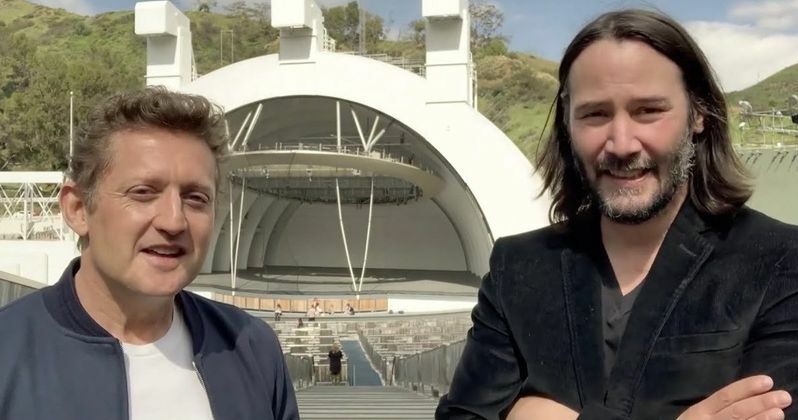 But things get progressively more excellent as both Alex Winter and Keanu Reeves continue on, as they confirm that production on the movie will finally be getting underway shortly after a long, long wait. And they make it clear that this is happening because the fans have been so vocal about the fact that they want it to happen. Therefore, it has been willed into existence. Here's what Winter had to say about it in the video. "It is all because of you guys, so we owe you a huge debt of gratitude and we wanted to say thank you. Be excellent." The video fades to a card that reads "Summer 2020." It was initially announced last year during Cannes that the sequel, officially titled Bill & Ted Face the Music, will be produced by MGM's Orion Pictures. Things have slowly been coming together behind the scenes ever since. Trying to work out the logistics of scheduling, getting financing together. All of that jazz. Quite importantly, the studio has confirmed that the movie will be released on August 21, 2020. In Bill & Ted Face the Music, the stakes are higher than ever for William "Bill" S. Preston Esq. (Alex Winter) and Theodore "Ted" Logan (Keanu Reeves). The two haven't fulfilled their rock and roll destiny and are now middle-aged men, but still best friends. The two set out on a new adventure when a visitor from the future warns them that only their song can save life as we know it and bring harmony to the universe. Along the way, they will be helped by their families, old friends and a few music legends. Dean Parisot (Galaxy Quest) is in the director's chair working from a script by original writers Chris Matheson (A Goofy Movie) and Ed Solomon (Men in Black). Production will be taking place in New Orleans. Scott Kroopf is producing alongside Alex Lebovici and Steve Ponce for Hammerstone Studios. Steven Soderbergh will be executive producing along with John Ryan Jr., Scott Fischer and John Santilli. Bill and Ted's Excellent Adventure and Bill and Ted's Bogus Journey, released in 1989 and 1991 respectively, have both gone on to become cult classics. While neither were huge box office hits, they've remained staples of pop culture, which is why there has been so much demand for a sequel. Be sure to check out the announcement video below from the Orion Pictures YouTube channel.